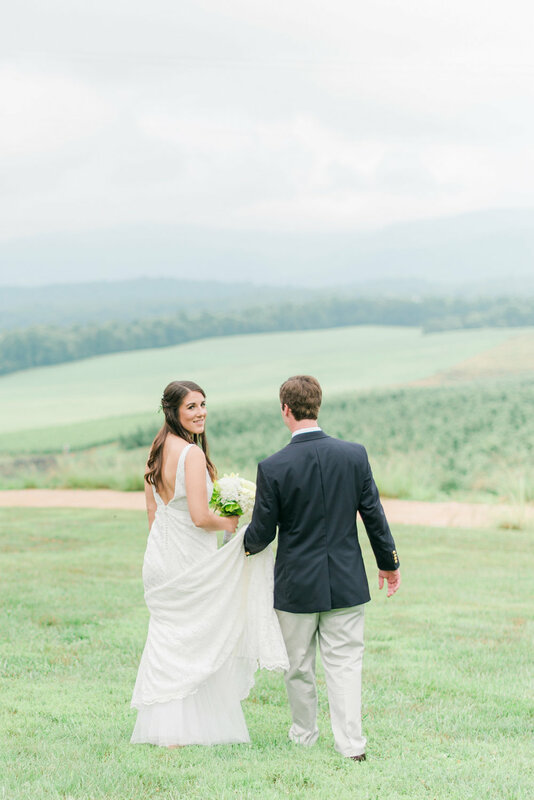 The wonderfully talented Kathryn Ivy shared the very special photos of Drew and Hannah's misty Summer wedding with us, and we couldn't help but to share them with everyone! Along with being BEAUTIFUL! this was a very special family wedding at Pharsalia complete with many special details. Pharsalia is a family home for Hannah and her siblings, and played a special part in her late fathers life. The family grew up playing here, and there was no question about where her wedding would be. Other special details of Hannah's wedding day included a bouquet of Pharsalia flowers made by her Aunt, Foxie Morgan, and a surprise of her fathers ring sewn into her bouquet. The Mountain views were misty, and perfectly matches Hannah's colors scheme of blues and sea-foam green. It is hard to believe that this dreamy day was in late June! Pharsalia's hand made Farm Tables, Paisley and Jade's vintage mismatched chairs, and assorted antique boxes with fresh floral designs finished the look in the reception tent. ... and there was dancing!